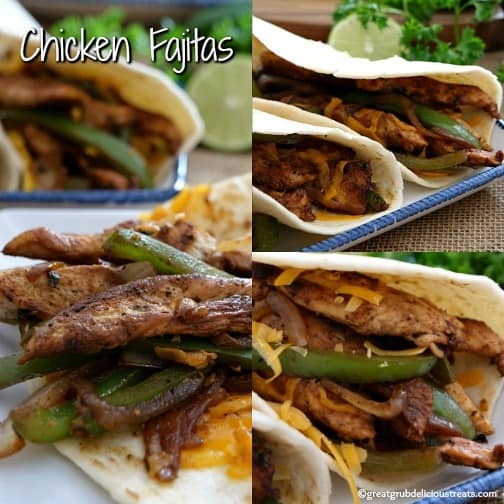 Fajitas are a favorite at our house and these chicken fajitas are easy to make and taste delicious. Talk about flavorful… these are super flavorful, full of that delicious Tex-Mex flavor that we all love. 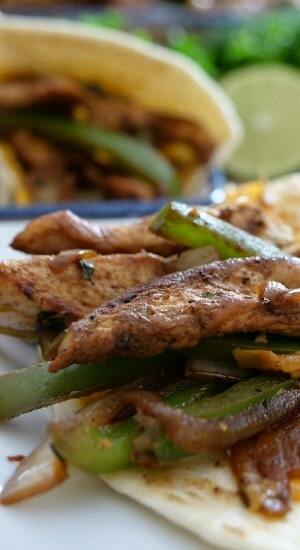 We’ve been on a fajitas kick lately so I thought I’d share my chicken fajitas recipe today. 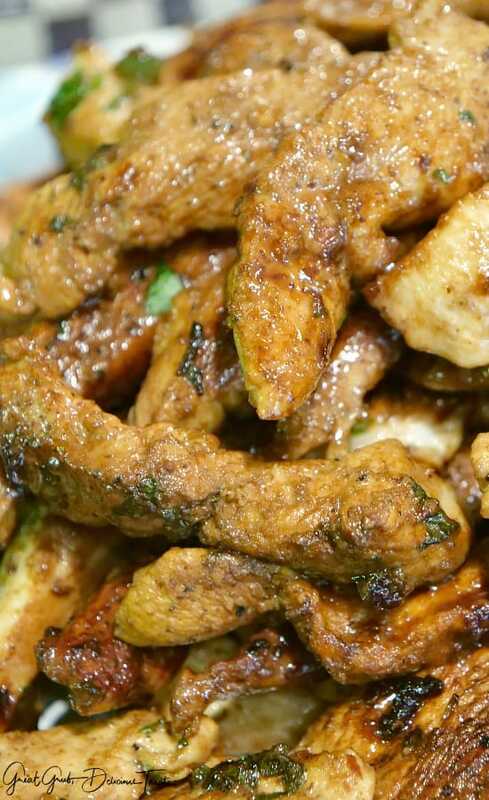 The homemade marinade is scrumptious and gives these chicken strips their tremendous flavor. 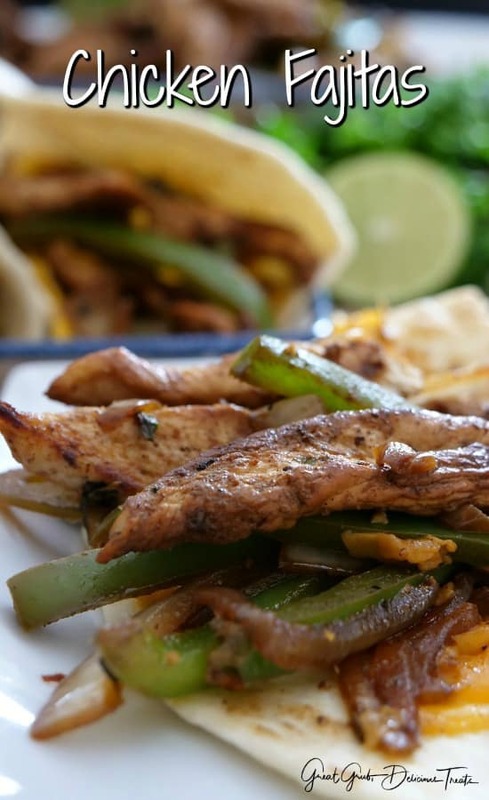 Making homemade fajitas is so worth the time it takes, which isn’t too long. Plus, you’ll save money making this easy to follow recipe at home. Start out by marinating the chicken for an hour to an hour and a half and these strips will be tender, juicy and full of flavor. Then fry in a little vegetable or olive oil over medium high heat until cooked thoroughly and no longer pink. I like using a cast iron pan because it sears the meat so well. Once all the tender juicy chicken has been cooked, remove and place on a plate. Loosely cover with foil until the peppers and onions are cooked. 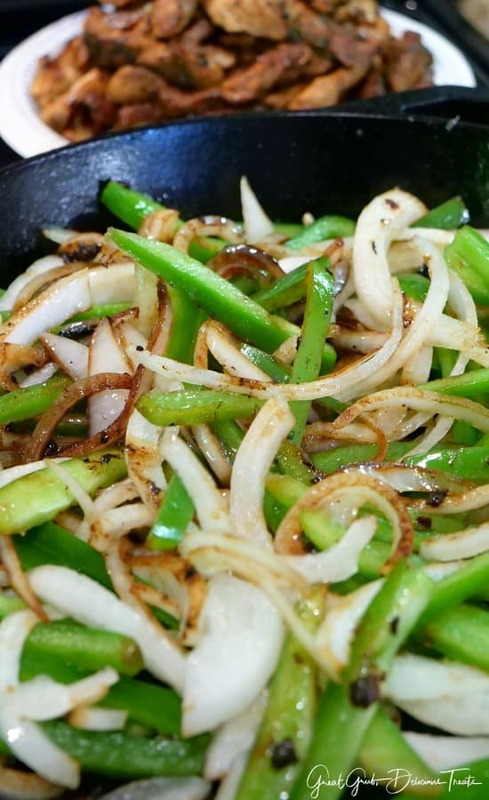 Fry the bell peppers and onions in the same pan. Add a little more oil if necessary and make sure to scrape the bottom of the pan to get all the seared chicken juices to mix in with the peppers and onions as they cook. 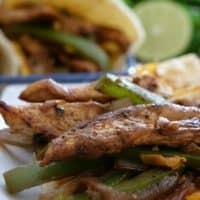 Once the peppers are tender but still a bit on the crispy side, add the chicken back into the cast iron pan and get ready to enjoy these easy homemade tender sizzling chicken fajitas. Rice and beans are perfect to serve with fajitas. Here is my recipe for charro beans that will compliment this meal well. 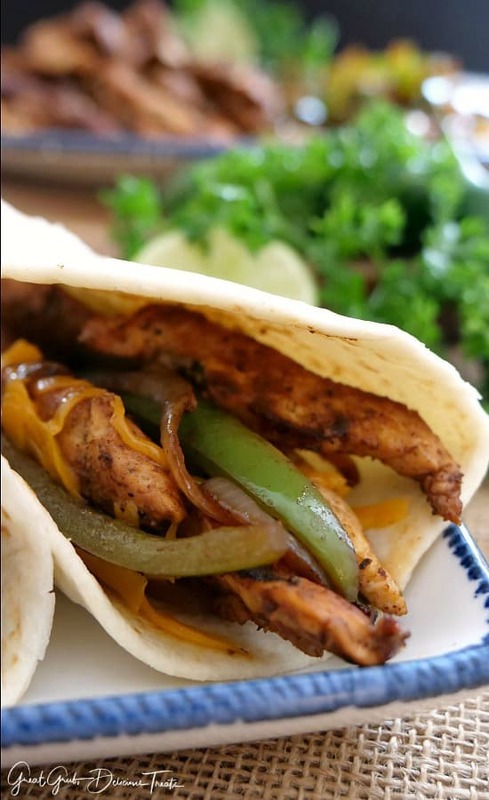 Next, add these sizzling chicken fajitas to flour or corn tortillas and top with your favorite toppings like sour cream, salsa, avocado, and while you’re at it, give each one an additional squeeze of lime juice, just because! 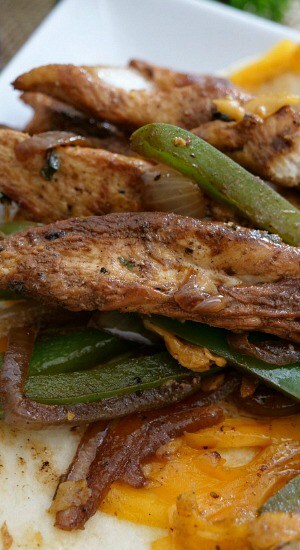 Taking a bite out of these delicious healthy chicken fajitas will have your taste buds begging for more. So yummy! And, any color bell peppers will work. I try to use all colors so my fajitas are super colorful but I only had green bell peppers at the time. 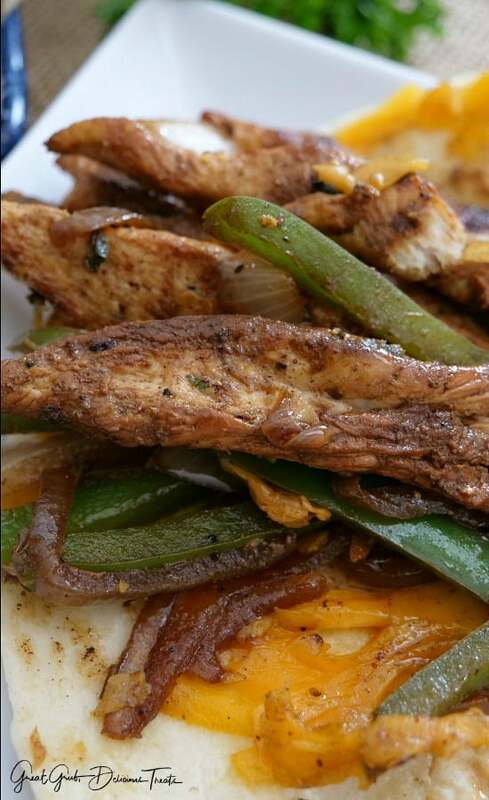 A colorful presentation is always a plus so go ahead and use all the wonderfully colored peppers in your fajitas. Here are some other delicious chicken recipes you can find on the blog. Make sure to check each one out. You are going to love these! Parmesan Crusted Lemon Chicken Strips, Crock Pot Cheesy Chicken, Spicy Chicken Pasta and Gravy, Crock Pot Cheesy Chicken Red Beans and Rice and these Awesome Chicken Burritos, plus many more! Cut chicken breast into 1/2" strips and place in a large resealable baggie. Sprinkle chicken strips with cumin, chili powder, pepper, seasoned salt and crushed red peppers. Add chopped jalapeños and cilantro to baggie. Squeeze the juice from the limes and orange onto chicken. Seal baggie and shake to mix. Place into the fridge and chill for an hour or longer, turning over a couple of times while marinating. Using a large cast iron frying pan, heat oil over medium high heat. 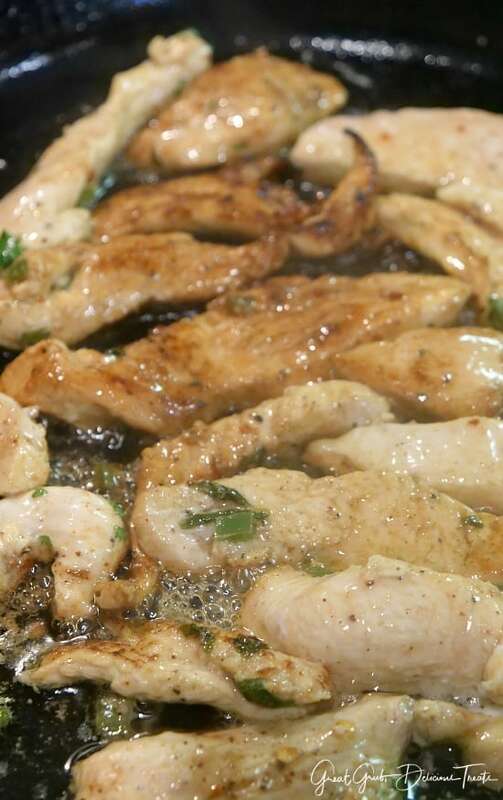 Place chicken strips into oil once heated and fry on each side until done and they are no longer pink, approximately 2 minutes or less on each side. Remove chicken from pan and place on a plate. Cover with foil to keep warm until veggies have been cooked. In the same pan, add additional oil if necessary, and sauté onions and bell peppers until peppers are tender but still a bit crispy. Place chicken back in the pan with the peppers and onions. Heat tortillas, assemble fajitas and add cheese, sour cream, salsa for additional flavor. 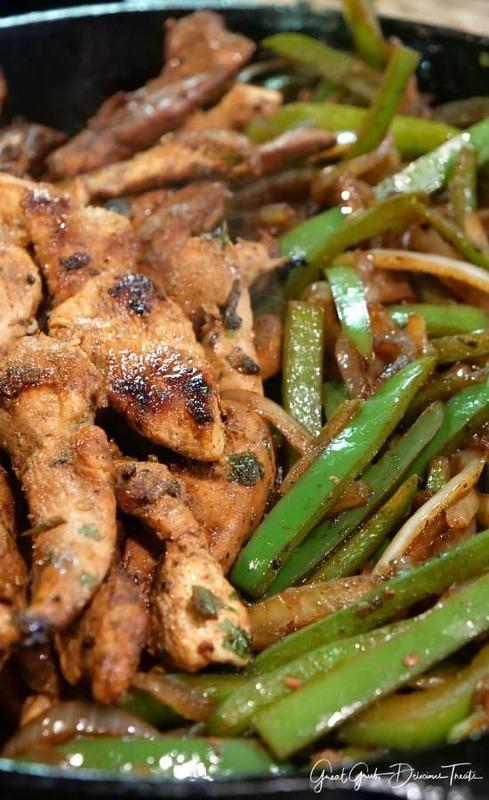 Charro beans and rice also goes well with these fajitas.